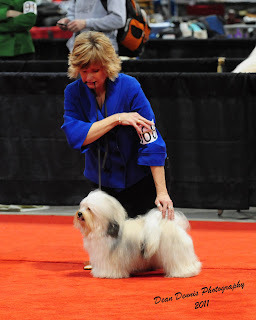 Oliver (Hydabrek’s What the Dickens) was at the 2011 Purina Nationals held at the Toronto International Centre last weekend. He picked up another 3-point major towards his Canadian Championship. Above are some candid photos take on the first day of the three-day dog show. I understand from the advertisements this show is supposed to be the Canadian equivalent to England’s Crufts and the US’s Westminster. The impression I gathered from many of the exhibitors was this show wasn’t any more important than most other shows in Ontario. Eukanuba’s Top 100, an unofficial CKC event, held at the Ontario Breeders Association Dog Show was a much bigger deal drawing dogs and their exhibitors from much great distances with both Canada and the United States. The Purina show was all decked out with red carpet in all the rings with fabric hangings outlining each ring. They also had a P.A. system they used to provide exhibitors and spectators updates, and they also used it to play the national anthem each day which is not a normal dog show ‘thing’. I was really disappointed with the lack of vendors available at the show as I came there is money hoping to check out new or not regularly seen vendors. Unfortunately, there was the same old vendor there that I would normally see at every other show so I walked away with most of my money still in my pocket. The price for food was ridiculous but I guess I could honestly expect decent pricing at a location like the International Centre. What I did like about the show was the carpet (colour doesn’t matter), the carpet really does help to keep the dogs clean, therefore I didn't need to bath Oliver between shows. The venue was spacious so when I walked around with Oliver there was lot of space for both of us to walk side-by-side and I didn’t have to worry too much about people not noticing little Oliver-boy and stepping on him. There was even carpet pathways within the grooming area which made walking through, especially loaded with Oliver in Crate in one hand and tons of stuff in the other hand a whole lot easier - the path was clear and not crowded with people's things. Because it is supposed to be a big show, I was hoping to go to a website somewhere and watch videos of breeds I would have like to have been there to watch. There is no website available to watch videos and no evidence of any camera crews other than local news reporters who only came on the Friday, the least busiest day of a three day dog show. I would like they would have enough money to consider do some video taping considering the outlandish prices to enter your dog for each event. Even “exhibit only” was the same amount as having entered your dog for one of the events. If the entry price for “exhibit only” was cheaper like in other shows, I would have like to have brought Caillee with me for the two days I knew I was able to attend the show to watch Oliver in the Ring. Caillee would have been nice company. I felt after entering Oliver for all three days of the Purina show and the catalog, Purina/CKC Nationals got enough money from me. I hope they listen to the exhibitors and really take heart to what they say. 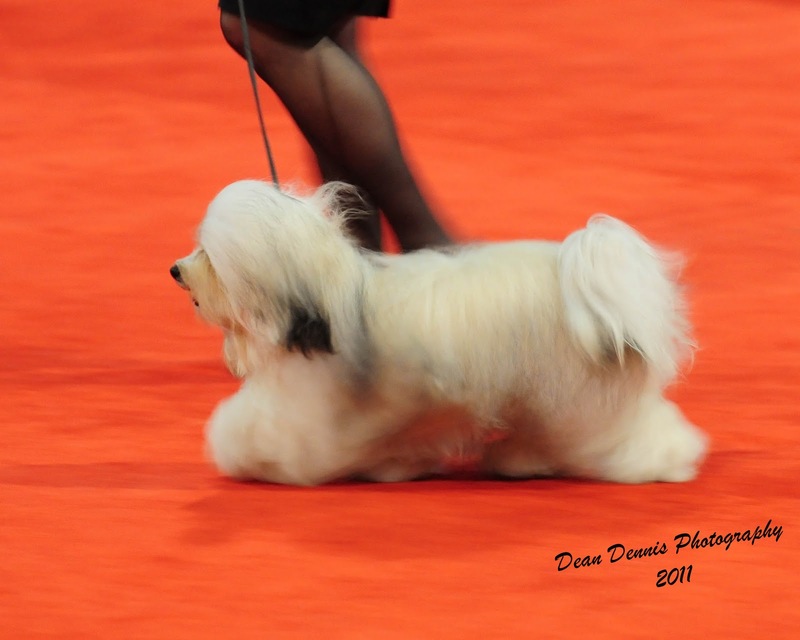 I know Canadians would really love to have a true equivalent to England’s Crufts and the US’s Westminster, but I don’t think the Purina/CKC Nationals is it…. at least not yet. Posting such a useful weblog. Your site isn’t only informative but very artistic too. There tend to be very couple of individuals who can write not too simple articles that creatively. Sustain the great writing! !